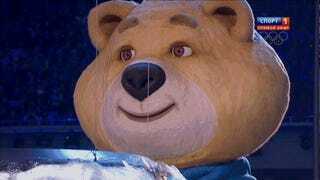 "He made reference to one of the last scenes, when the slightly terrifying bear mascot shed a single tear for the close of the Games. He traced a line from his eye down his cheek with his finger. 'I was like bear,' he said. I was like bear, too, at that point." Katie Baker's final dispatch from Sochi is a treasure.